The Kindle Fire just started shipping, and Amazon is of course ready with some cases for you. It seems that Amazon is seeing the Fire as a reader instead of a tablet, at least based on the selection of covers. It seems most of them are sleeves or book-style covers and not stands. The Verso Artist Series cases are light-weight book-style cases with covers designed by various artists. Shown is the Cities case in red by Sharyn Sowell. The covers have a microfiber interior and patent-pending elastic corner straps to hold the Fire in place. (I’m not sure what’s patentable about a corner strap, since covers have been using them for years…) The Cities case is $39.99. 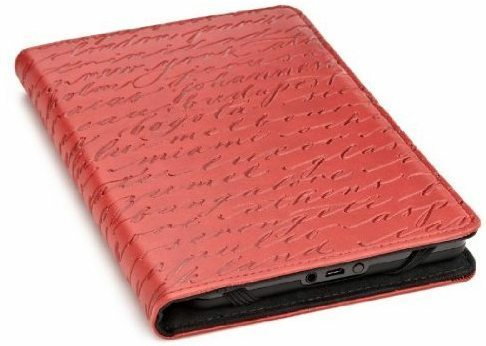 Kindle Fire Cases to Protect Your New Tablet originally appeared on The Gadgeteer on November 15, 2011 at 12:00 pm.